In lieu of actual content, I bring you my latest and greatest hair creation. Well, not my creation – I pay someone else exhorbitant amounts to create my coif. Still, I’m diggin on it. Also, my stylist (Lisa @ AXIS) keeps handing me cards for 50% off a cut or colour for new clients, so if you like what you see, leave me a comment and I’ll hook you up. Nice! Like I said earlier, it pairs wtih your complexion quite nicely! your hair is sooo cute.. I love Axis they ROCK! I think you look like Val Cole the radio personality. It’s a compliment because Val Cole is one of the prettiest women around. I love it! What a great cut. I’d like a hookup with one of those discount cards. I’ve heard good things about Axis, and I wouldn’t mind trying somewhere new. 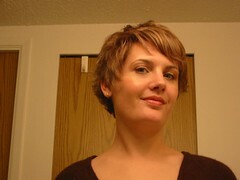 Mel: after the cut, colour, toner, bottle of product, tax, and 15% tip the grand total was $220. Of course, it’s not usually that much – the toner is a once a year change when I want to darken the blonde, I only get it coloured every 2-3 cuts and buy product every 3-4 cuts. Oh man – that’s adorable! And if you still have a card, I’d love it .. I’m in DIRE NEED of a haircut, and need to see someone who can cut a cute hair! I can also vouch for Lisa, as I saw her in August with one of Jen’s coupons. But sweet jesus, $220? That’s robbery. Wow, that’s expensive! Nice damn hair, but seriously! It almost makes me want to have one of them stores out here!